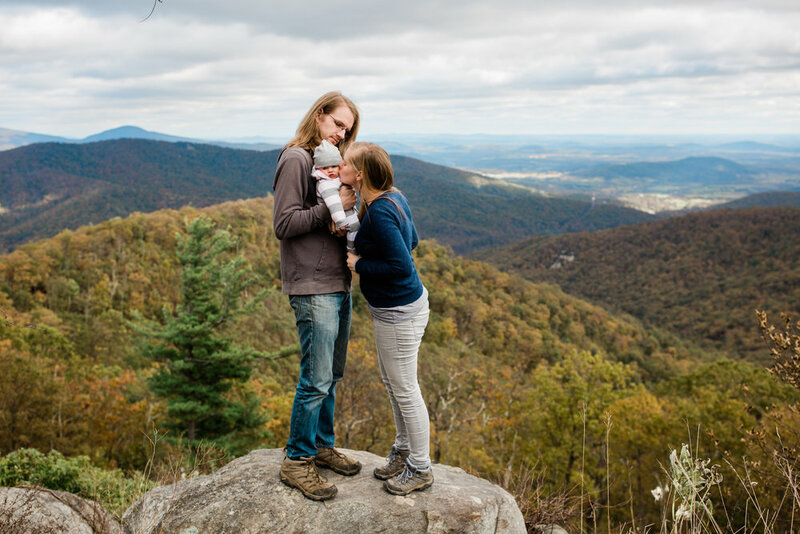 Shenandoah National Park is magical in late fall, so when an old, old friend asked me if I could take some shots of her family, I couldn’t say no! Heidi and I have known each other since junior year of high school — more than a decade ago — and ended up graduating from the same college in Harrisonburg, Virginia, (I transferred in junior year). We were in/at each others weddings (I just had my sisters/mom as my bridesmaids, but my friends hung out for getting ready and pre-wedding festivities) and both have very expensive degrees in liberal arts — yes liberal arts — that we’re still figuring out what to do with. Auri was three-months-old at the time of this shoot and was totally uninterested in anything other than hanging out in her mom’s arms. So that’s what we did. I had two of my dogs with me when we met up so the pups explored the side of the mountain/tried to help Auri appreciate a good doggie kiss while we shot. One of the things I love about shooting in Shenandoah National Park is that there are beautiful shoot locations for all kinds of needs. Before I met up with Heidi, I shot this sunrise proposal/engagement session. To get to that overlook, you have to hike up the mountain a bit. But when shooting kids, families, dogs or people who aren’t nearly as into trekking up mountains as I am, you can just drive along Skyline Drive, pick a pull-off that suits your fancy, hop the wall and take some beautiful shots right by the road. We shot this entire family session about ten feet from my car. Shenandoah is my home stomping grounds, and I’m slowly learning every inch of her. So if you want to go on a Virginia adventure with me and want some stunning mountain views, I couldn’t recommend this park more.